“Penny Pritzker has a long and storied history as being an anti-labor, anti-worker kind of boss. She has supported policies that have had an adverse impact on working-class families and their children. 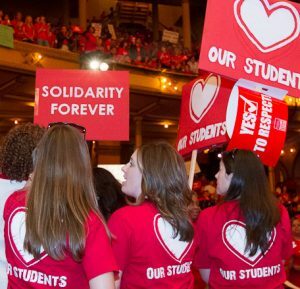 As a member of the Board of Education she has worked to close schools, destabilize neighborhoods and disrupt the economic lives of thousands of public school employees,” said CTU President Karen Lewis. “In addition, Prizker’s luxury hotel chain, the Hyatt, has benefitted directly from the TIF program which takes money away from schools and gives it to wealthy developers, and she’s allowed this to happen despite the conflict of interest and the damage it does to our schools. We cannot imagine that someone who has a long history of bludgeoning Chicago’s working families and destroying public schools would be given a platform to continue these sorts of business practices on a national level,” Lewis said. “She has been the subject of countless protests because of her business practices and for her support of policies that are harmful to students in Chicago Public Schools. 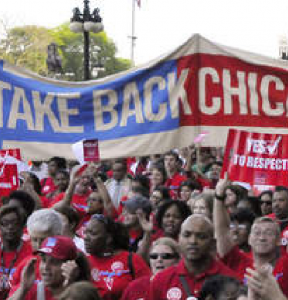 The Chicago Teachers Union has certainly been quite vocal and visible in those demonstrations.